I love it when I actually get to dig into my bins of unfinished projects and continue to work on them. This has been one of those days and I’m excited to share it with you! It all started because Xyron announced some new product releases and the Xyron Design Team members were able to play with them. We had the new dots and tapes in both sizes and I really wanted to focus only on those products so I really had to give it some thought as to what I could do with only these adhesives. I thought about my six wood home-decor blocks that I had made several years ago for Spring – always intending to complete the other three seasons so they could be displayed throughout the year with a simple rotation. After wiping off years of dust I was ready to begin. I used Xyron’s newest High Tack Adhesive Dots in 3/16 in. and 3/8 in. 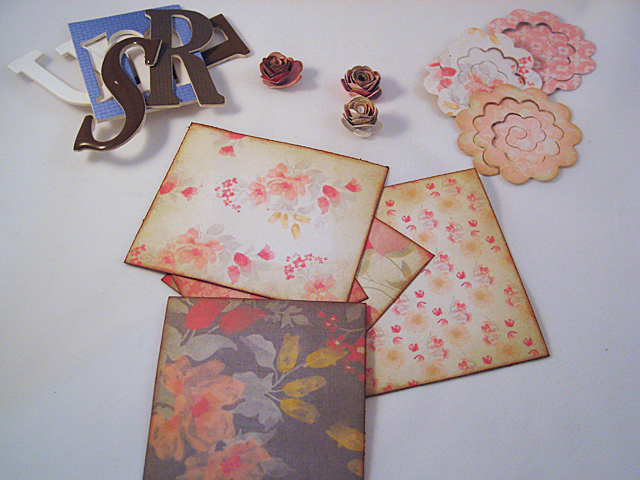 along with Xyron’s Double-Sided High Tack Tape, a 6X6 paper pad from My Mind’s Eye (In Bloom) for my backgrounds and a mix of chipboard letters from my stash. The rub-ons are by Kathy Davis, Journey’s, from GCD Studios; ribbons by May Arts. The white letters are painted brown with Ranger’s Espresso Adirondack Paint Dabber and the blue ones covered with the coordinating papers (by running them through my Xyron 2.5 inch Create A Sticker machine, then trimming and sanding). I made some dimensional flowers by cutting them from the coordinating papers with a Sizzix die – Flowers, 3-D (I used the smallest flower). The papers are cut to fit the wood blocks with an inset margin of about 1/8 inch. The edges are all inked with Ranger’s Distress Inks, Old Paper and Vintage Photo. I stitched on some of the papers just to add a little character and grabbed a few buttons. Now I’m ready for assembly. 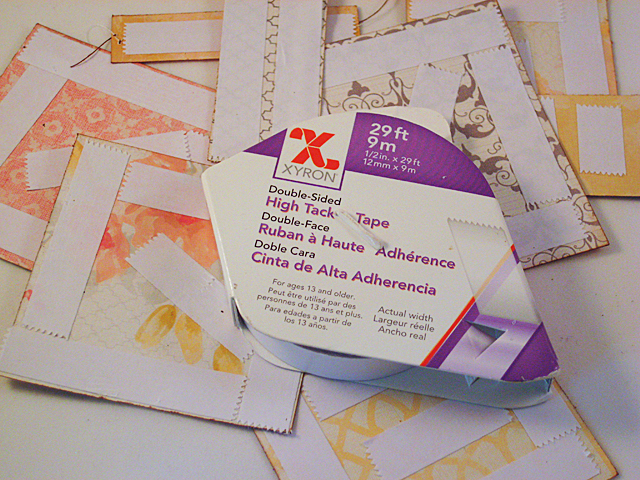 I used the Xyron Double-Sided High Tack Tape, in it’s own dispenser, on the outer edges of all the background papers and any little strips I thought I might add. The handy built-in dispenser is pretty easy to use and the tape tears very nicely. The paper lining peels away very easily from the tape so taping and peeling went very quickly. One thing I can say about this tape is that it is VERY tacky and it adheres nicely to the wood. Once the background papers were all taped into place I moved along to embellishing. This is the fun part! 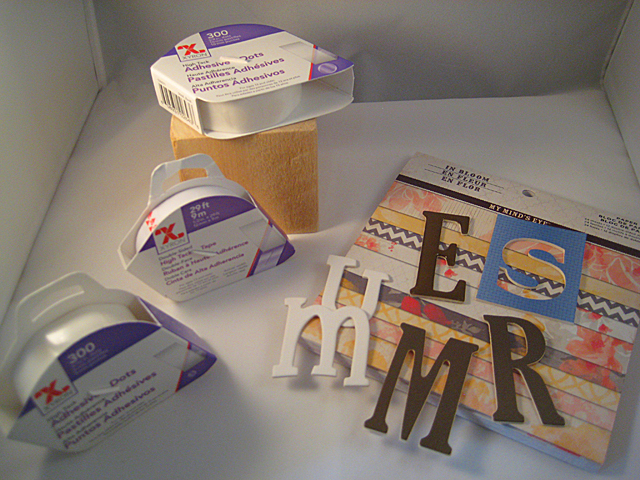 I added the rub-ons here-and-there, tied some pretty ribbons around a few letters then used the Xyron 3/8 in. and 3/16 in. dots to adhere everything in place. I am amazed to think I only used these three adhesives on the entire project. It made for a nice clean finish and the only thing left on my fingers were the inks and few rub-on pieces that got stuck there somehow. I can display these blocks lined up or stacked. They look nice on a mantle or in a window sill and I only have two more seasons to do! It is so fun coming to your blog. I had to give up scrapbooking and crafting, when we moved to Florida, but when I come to visit you, it brings back all the memories! Love it. These are so cool, Linda. I love the idea of switching out each season. Thanks, Marjie. One of these days I’ll finish them! I love these blocks, Linda! What a great idea. I love the paper and embellishments as well. How big are they? You say you made them. 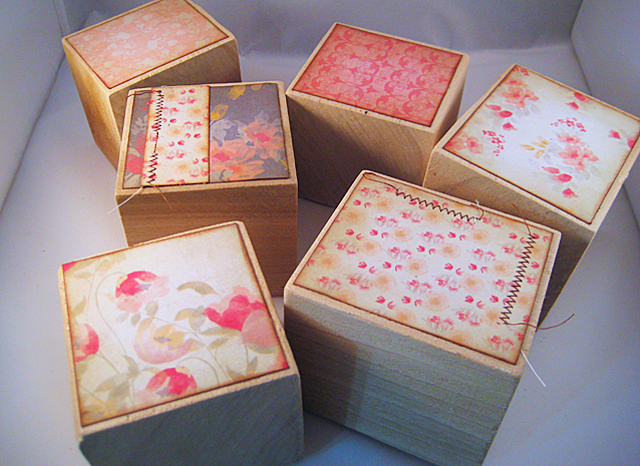 Do you have an idea of where I could buy these blocks or point me to some on-line instructions for making them? Great job, as always! Thanks, Denise. They’re about 3 inches square. I bought a nice piece of lumber from a mill and cut them in staggered sizes. 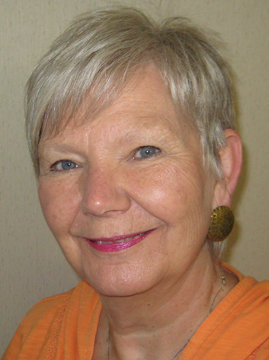 Linda, how very cute! I love the seasons idea on the blocks!